A blog post by author Marion Nestle sparked a fire of discussion on the food coloring debate. Adam Ozimek from Modeled Behavior didn’t understand Nestle’s objection to artificial coloring. She responded to his questions in an interview. AO: You say that food coloring is “unnecessary and deceptive “. But couldn’t you say the same thing of essentially any garnish or cooking technique designed to make food appear more appealing without physically modifying the flavor? AO: You say that food additives aren’t “needed” but there are many ingredients and foods which aren’t “needed” given the variety of substitutes and choices we have. If you’re looking at how much a product is worth to consumers, and trying to understand how consumers will be harmed by banning it, isn’t ”valued” a more appropriate criteria than “needed”? Shouldn’t that be what regulators consider? Responding to the Omizek/Nestle interview, Megan McCardle of The Atlantic was still puzzled. I do not understand what her definition of “artificial” is. GE Monogram Gas Ranges are not grown by organic farmers who mulch the plants with steel shavings. Iceberg lettuce is a human creation. In fact, almost nothing in my kitchen–from the whole shelled nuts, to the baking powder, to the appliances, can be found “in nature”; they’re all the result of considerable human ingenuity applied to the problem of making our food more palatable and attractive. Actually “natural” foods would also come with things like toxic fungus and horrible parasites which–I guarantee–are much worse for children and other living things than artificial food coloring. “Natural” is not synonymous with “better for you”. It’s absolutely true that you’re probably less likely to get fat if you eschew highly processed foods in the snack and cereal aisles. But oversimplifying this message to “natural good, artificial bad” quickly turns ridiculous. There are two major questions on food coloring. Additive coloring flows, like a river, through grocery store aisles. Yellow dyes are added to pickles and pepper rings to make them appear fresher. Colas get their opaque quality from caramel coloring. Store-bought cheddar contains annatto to achieve its orange glow. There’s a tradition and culture of eaters who believe that it’s pointless to add coloring to foodstuff. These folks prefer their taffy resemble … whatever color taffy happens to be before it’s brightened for retail. Their argument is simple: Coloring does not add nutritional value, so why bother? What makes a vibrant cupcake better? Nothing. But … color changes the way we experience food. Eating isn’t the unique domain of your tastebuds. All of your senses play a role. You smell the wonderful aroma of a freshly-baked pizza, your eyes pause to examine its perfection, you pick up a slice and feel specks of cornmeal underneath a still-hot crust. You’ve already experienced the pizza before it reaches your tongue. As a component of experience, color can work with or against perception. Customers buy bright yellow pickles because they look tastier. And if they try both in a taste test, they’ll say that the one that looks fresher is superior. Is there a practical difference between naturally-sourced food coloring and artificial food coloring? If you decide to go with food coloring, you have another choice to make: Natural or artificial? Most food coloring available in stores is the synthetic stuff. As of 2011, seven chemical-based dyes are (for now) approved by the Food and Drug Administration for human consumption: Blue #1 (a bright blue), Blue #2 (indigo), Green #3 (a shade of turquoise), Red #40 (a stark red), Red #3 (a pinkish red), Yellow #5 (the classic neon yellow), and Yellow #6 (more of an orange). From this base of primary colors a food engineer can create any shade she desires. Artificial food coloring is common because it is cheap. You can pick up primary colors from any grocery store for a few bucks—the natural versions are much harder to find and will cost extra. We’re talking 2 to 5 times as much to start. Because of the price and scarcity, I rarely muck around with color additives. Tie-dye cupcakes have never appealed to me. Naturally-sourced coloring has diverse origins. 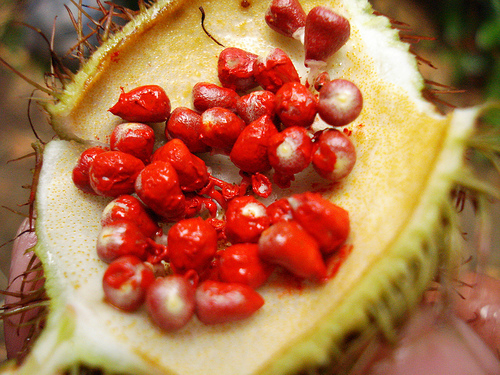 Annatto, the dye used to make cheddar cheese orange, comes from the seed of achiote fruit. Caramel color used in soda is a product of sugar and heat. Grape juice is added to lemonade to make pink lemonade. Another natural red dye comes from cochineals, a parasitic insect native to South American and Mexico. Yes, technically the coloring from a mashed-up bug is natural. Don’t worry, though—food manufacturers in the United States are required to tell you when you’re dining on cochineal juice. You’ll see it labeled as carminic acid or Natural Red #4 in products such as beef and sausage.